Volvo Concept XC Coupe has jus been unveiled. Its design is inspired by that of modern sports equipment and therefore the car is perfect for people with an active lifestyle and who love extreme sports. Concept XC Coupe also demonstrates vital elements of the Volvo’s new Scalable Product Architecture (SPA). These include confident stance, proportions and the most prominent design signatures. The vehicle also shows how clever engineering makes it possible to reinforce safety without compromising on design, size or weight. The reason for this is that the car has been manufactured with the extensive use of high-strength boron steel and structures. Furthermore, the concept runs on larger 21-inch wheels and has a taller roofline. The extended distance between the dashboard and the front axle is also a very powerful visual element. The powerful and sporty stance of the car is emphasized by details such as the new bonnet and a beltline that spans an elegant bow along the length of the car. As mentioned, the connection with modern, high-tech sports gear is highly present in the concept car. Among the sources of inspiration for the design team is the Swedish company POC, which develops high-tech protective gear for extreme sports athletes. 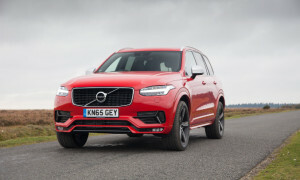 The result is that the design team has given the XC Coupe a traditional SUV look which includes elements such as side mouldings and skid plates, but mixed with modern characteristics which makes it athletic and futuristic. Volvo Concept XC Coupé is characterised by new bonnet with ‘floating’ grille, flanked by headlights featuring new T-shaped DRL light guides. The rear light signature is also a distinctive element in the new design philosophy of the brand.